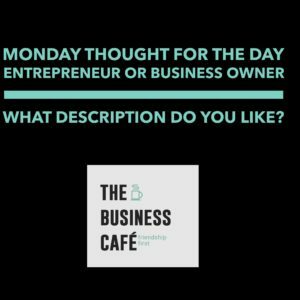 Thought for the Day – Entrepreneur, small business or what? Over the past week I have spent time around people who refer to business owners as entrepreneurs. I refer to them as Business Owners. Occasionally I say Small Business, Micro Business, Sole Traders or Solopreneurs. I am not going to say much more as I don’t want to share my opinion and ‘lead the witness’ may I ask what you like and what these words mean to you?